Front Label: ABV on left; ABV on right; Moet & Chandon (Suisse); Moet Hennessy (Suisse); US (BF). 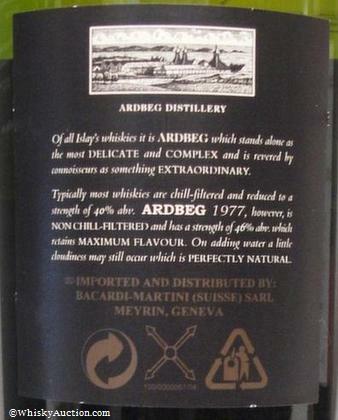 Back Label: UWE; Velier; DGP; Bacardi-Martini (Suisse); US. 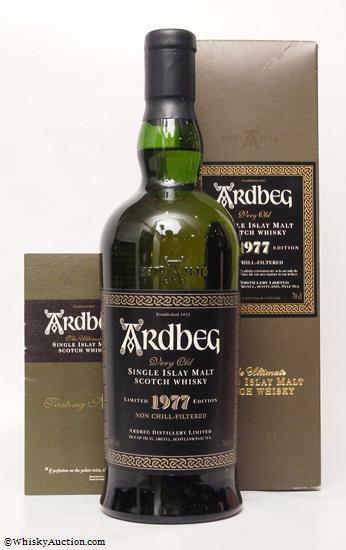 "A vintage of exceptional balance and depth"
Here at Ardbeg we're delighted to announce the launch of our second Vintage, 1977, which will be widely available from the end of June 2001. 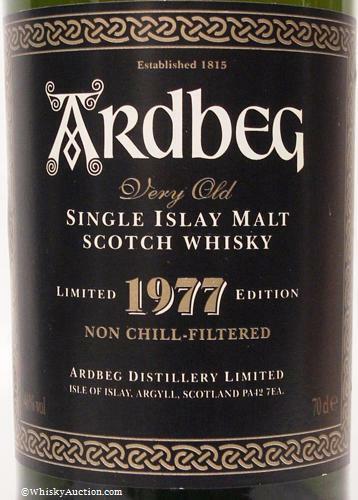 Non chill-filtered for greater flavour, it is an absolute delight. 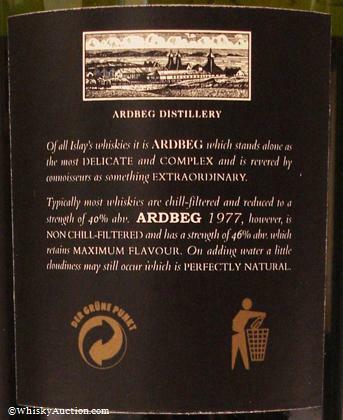 And with so many very special characteristics, we rank it close to Provenance. 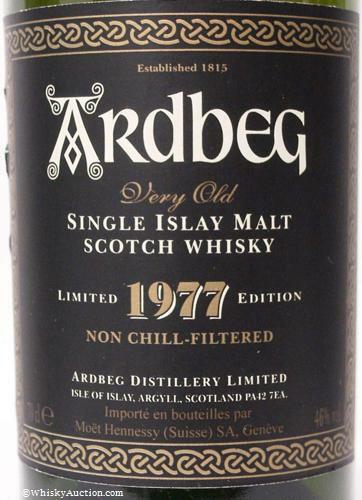 Due to the limited stocks of Ardbeg, it's likely to be the last Vintage we declare for at least ten years. At present, because of technical difficulties, it is not possible to purchase this from our website. 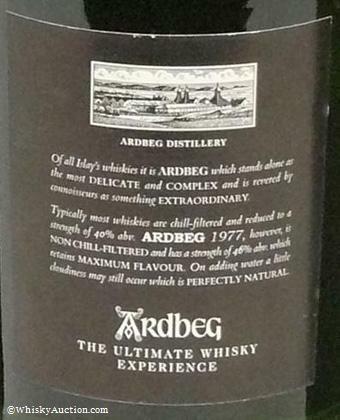 However, you're welcome to call us at The Distillery on +44 (0) 1496 302244 or fax us on +44 (0) 1496 302040 to place your order, if you cannot find it in the shops. 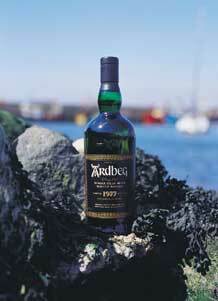 Nose - An enormous whisky, embodying the perfect balance of sweetness, fruit and deep smoky aromas. 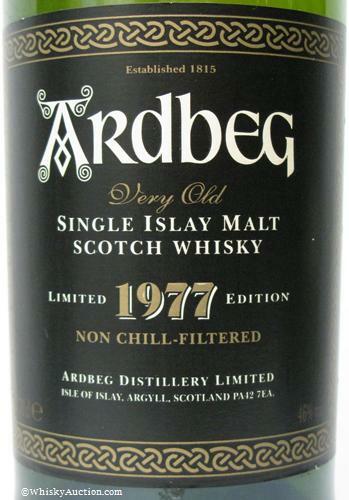 This vintage is a truly sensational example of Ardbeg matured in quality American oak ex-bourbon barrels. Toffee and fudge sweetness emerges first with peat encased in milk chocolate. Mandarin fruit is discovered through the chocolate with a sprinkling of cocoa powder. The oak is gentle and scented, both balsamic and spicy revealing eucalyptus oil and cinnamon. With water, dessert sweetness is uncovered with lemon curd and bitter almonds followed by vanilla. 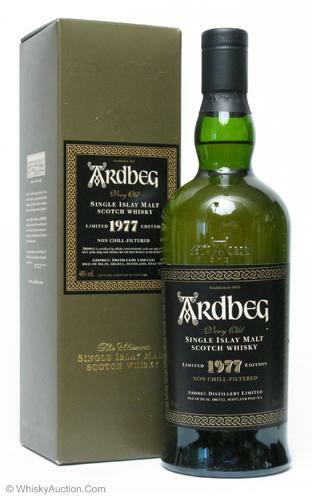 The deep smokiness of Ardbeg emerges with the hallmark aromas of tarry rope and cigar smoke, yet it is soft and scented with woodsmoke, burning incense sticks and cappuccino coffee. 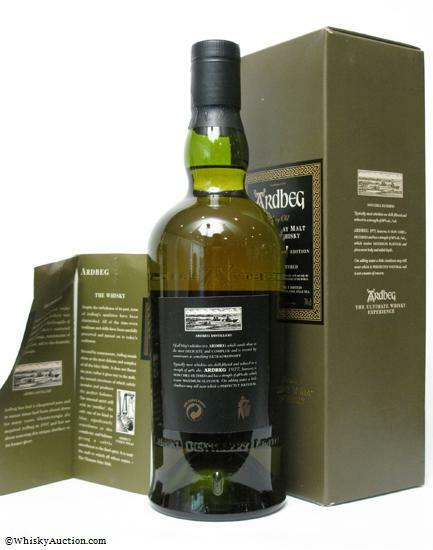 Taste - Sensationally smooth and peaty, a mouthful of soft and chewing peat smoke rapidly takes centre stage. The mouthfeel is at once silky, velvety and chewing. The flavours are sweet and scented with milk chocolate, mandarins and parma violets. 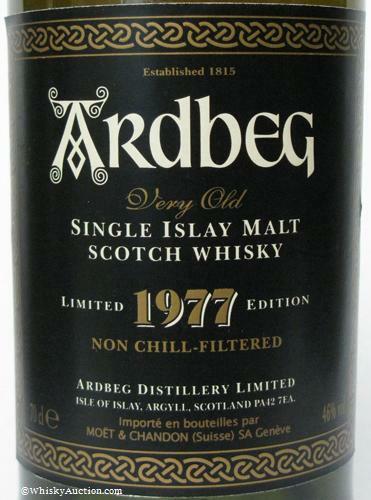 Peat is present throughout the taste, constantly filling the palate with cocoa and scented smoke from beginning to end. Finish - The taste refuses to go away. The finish is very long and scented with woodsmoke, mandarins and cocoa. Front Label w/ABV on left. Front Label w/ABV on right. Moet & Chandon (Suisse) Front Label. Moet Hennessy (Suisse) Front Label. 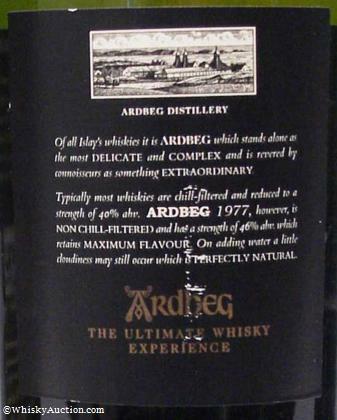 Ultimate Whisky Experience (UWE) Gold letters - Back Label. 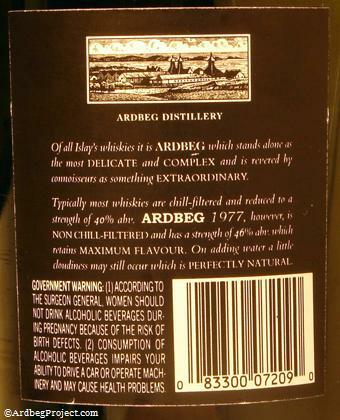 Ultimate Whisky Experience (UWE) White letters - Back Label. 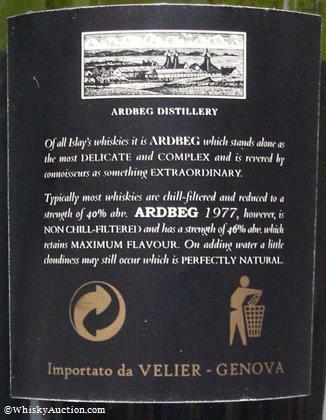 Velier-Genova Back Label. Der Gr�ne Punkt (DGP) Back Label. Bacardi-Martini (Suisse) Back Label. Brown-Forman (US) Back Label. 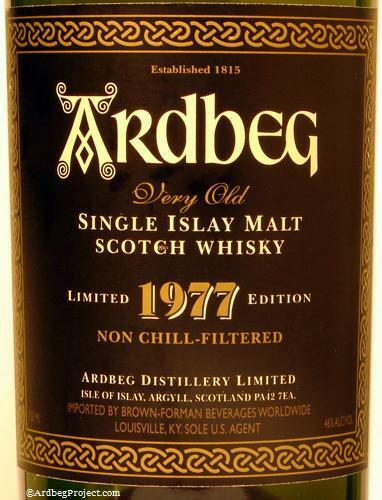 Bottle Codes for "1977" and any other expressions bottled in close range.